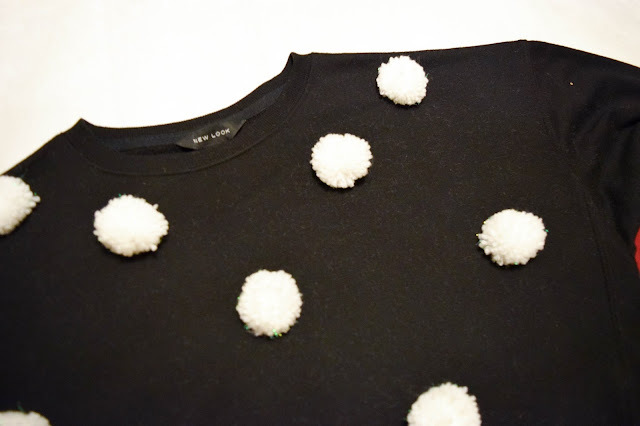 Since about a month ago, I had the idea of making a Christmas jumper using pom poms. 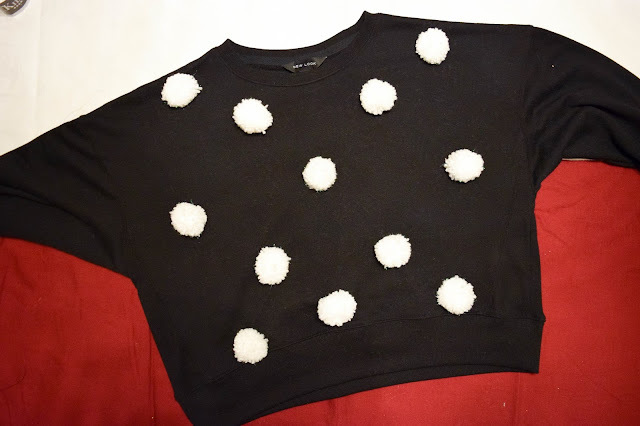 I was inspired by all the pom pom jumpers that are on trend at the moment and knew I could probably make one of my own for much cheaper. All it would take is a little time and the right tools. So that is what I did and it went so well I thought I'd share my DIY with you for Day 4 of Blogmas, so that maybe you could make your own too! 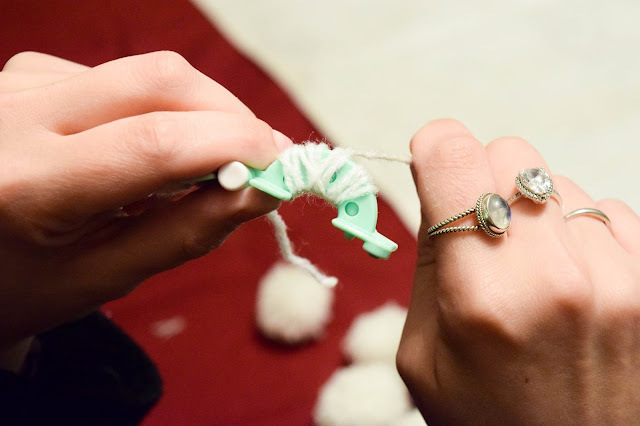 So the very first thing I did was grabbed my smallest pom pom maker from my set (which I bought from Hobbycraft) and my wool and started making pom poms. 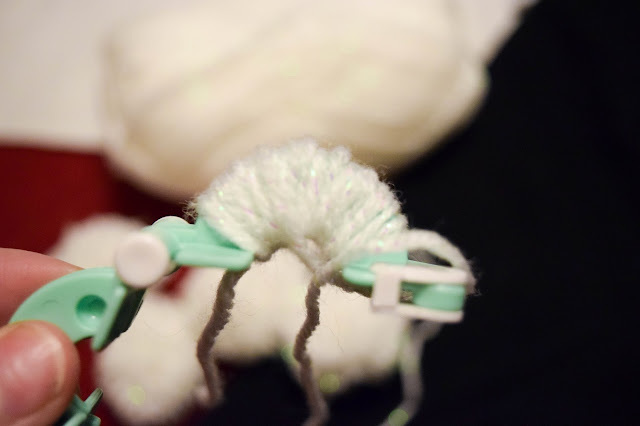 Pom poms are actually quite easy to make. 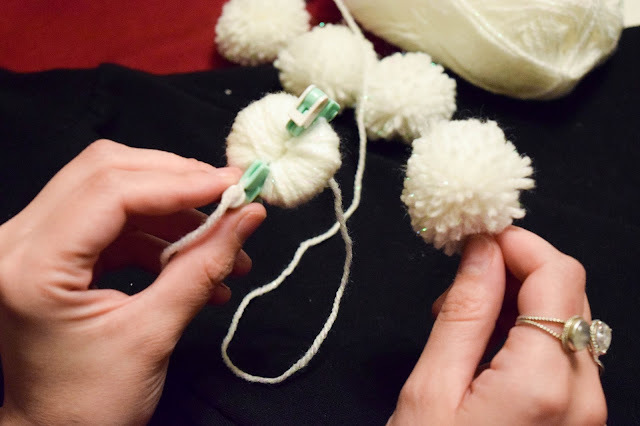 On one of these pom pom makers you place the two parts together so that the bumps are facing inwards and wrap your wool around it as shown. You do this over and over until you fill the gap in the semi-circle. Then you do the same on the other side. Once you've done that you can close the whole device as shown below, lock it and then you can start thinking about cutting along the grooves of the circle all the way around. 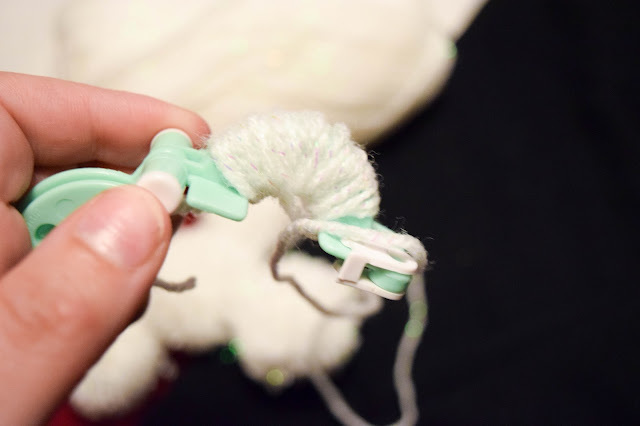 Finally you can get a separate piece of wool and tie a really tight knot in the gap to tighten all the wool together before pulling the pom pom maker off leaving a little puffed up pom-pom ready to go. Repeat and make as many as you need. I stopped at 12. 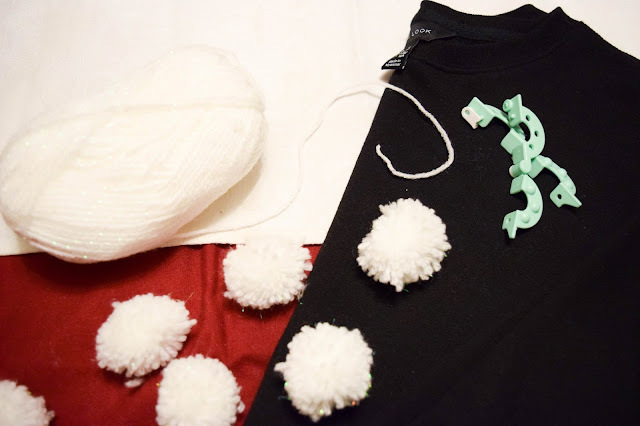 With my 12 ready pom poms I started thinking about placement. 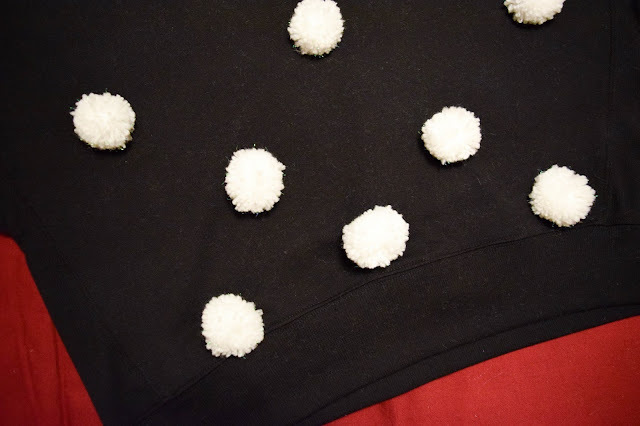 I knew I wanted to keep the sleeves empty because I wanted to make sure that I could wear this with a coat on top and so that it was a bit more functional in the sense that the pom poms wouldn't get too in the way. I laid them out on top of my jumper to see if I needed to make anymore and luckily I didn't! I was happy with the placement so it was now time to sew them on. I just sewed them on with a needle and light grey thread (because I didn't have white). And just like that, I made myself a 'snow at night' Christmas jumper! I know I could probably make it more Christmassy but I wanted something a little more subtle that you could wear more often during the run up to Christmas. I kind of want to make another one with a pom pom wreath on the front or one that isn't Christmassy at all that is just really colourful - maybe with bigger pom poms! Maybe just on the sleeves.... SO MANY IDEAS! Altogether, this jumper cost me about £14 to make and about 2 hours of my time. The jumper was on sale for £9 when I bought it but is now around £7, the pom pom makers were £5 for 4 and the wool was some I had lying around from my mum's previous knitting projects. Even if I'd bought the wool and made my own pom pom makers then it would still cost the same. I decided to buy the pom pom makers because I knew I'd use them later in in future projects. I hope you like my DIY! Let me know what your thoughts are in the comments below. 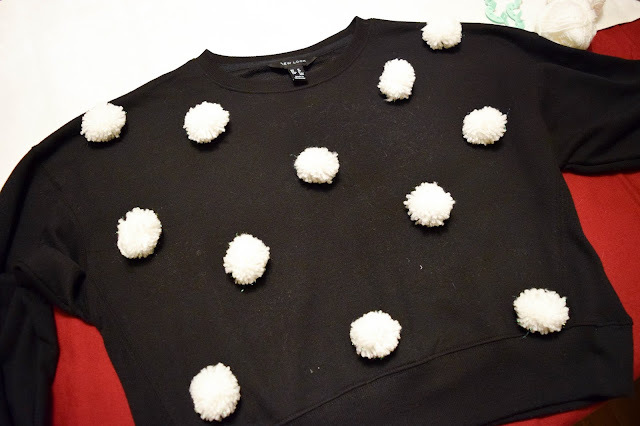 Would you have a go at making a pom pom jumper like this?